The GNOME Newcomers Workshop might be coming to a conference near you this summer! Owen Taylor and I will be hosting one at GUADEC in Strasbourg, France on Saturday, July 26 and one at Flock in Prague, Czech Republic on Saturday, August 9. If you have never contributed a patch to GNOME before or even have never used GNOME, this workshop is for you! You’ll get a quick overview of the GNOME project, have a chance to install GNOME in a virtual machine, and learn the tools and the process of contributing a patch. If you plan to come to either workshop, please add yourself to the list of attendees. If you can’t attend one of the workshops, you can install the available image in a virtual machine and go through the newcomers tutorial used at the workshop on your own. You can ask any questions you have on IRC. We would like to have one helper per three newcomers at the workshops. If you are an established contributor and will be available, please sign up now to help with the workshop at GUADEC or Flock, and then you can check the room in the beginning of the session to see if we need your help based on the attendance. I’d love to see more people running the Newcomers Workshop locally or at other events they attend. Helping out with one of these sessions would give you a chance to learn how it works. In addition to hosting the Newcomers Workshop, I will be speaking about how to be an ally to women in tech at GUADEC and about the Outreach Program for Women at Flock. Thank you to everyone who spoke up in the last few days in support of the Outreach Program for Women. The reason we need to have this program is that there are many challenges women encounter on their path to technology, and by working to address this disadvantage, we not only do the right thing and help women access the rewards of participating in free software, we also get awesome contributors whom we would otherwise have missed. Girls and women are systematically discouraged from exploring technology and from participating in the more hobbyist areas of technology, which are especially male dominated. They don’t typically have the kind of social support or encouragement men do to contribute to free software. By the time they work on their computer science degrees, they often feel behind their male peers in their experience, underestimate their abilities, and are less likely to apply for prestigious programs like Google Summer of Code. Women often encounter sexist behavior when participating in the free software community. Recent examples from OPW interns include men being surprised about one of them attending a conference and commenting about the appearance of another in a professional context. Here is a quote from the first intern at a recent IRC meeting for interns: “I attended FOSDEM and a couple of guys came to tell me they were surprised to see a girl there… You feel like you’re not supposed to be there, like you’re doing something wrong… So it was nice to have this space here, and feel like I was in the right place.” When an organization posted an article on Facebook about another intern’s impressive work, among many congratulatory messages there were comments about the developer’s appearance. In addition to people speaking up about the inappropriateness of such behavior, support groups for women joining our community can help address the immediate negative feelings after such incidents. The brilliance and drive of the women we accept for OPW have always left me in awe. To think that, judging by the historical data, they would not have been likely to get involved otherwise and we would not have had their contributions is sad. The program has had 170 interns so far, with 40 of them participating in the current round with 16 free software organizations. We had 122 applicants for this round who worked with a mentor and completed the required contribution. Because of the many outreach efforts, including OPW, the percent of women among GSoC participants increased from 7.1% in 2011 to 9.8% in 2014. OPW encourages women who are students and coders to apply for GSoC as well, and of the ones who applied for both programs at the same time, 26 were accepted to participate in GSoC. An additional 11 OPW participants went on to participate in GSoC in a later round. 13 found employment with sponsoring organizations. 15 gave full session talks at conferences. This is a sizable change, but we are in the beginning of a long road. The group, including 3 OPW alums and 4 mentors, at the Feminist Hacker Lounge at PyCon 2014. There was only one girl among 40 teenage Google Code-in grand prize winners in the last two years. About 10% of the participants were girls. While OPW is effective in involving college and post-college women in free software, we are set to run the program forever, unless we also start involving high school girls in free software. For the next Google Code-in, I’d like to engage our network of OPW alums, mentors, and supporters in mentoring high school girls in Google Code-in participation. I’d like to invite people to step up to start and lead this effort. The first step would be to form a local group of people to teach workshops similar to OpenHatch’s “Open Source Comes to Campus” at local programming for girls groups, programming camps, or high school CS classes. You would then need to report on your experience and set up the resources for people to replicate it in their locations. The next step after the workshops would be to organize meetups at local libraries for mentoring in ongoing free software contributions and Google Code-in participation. 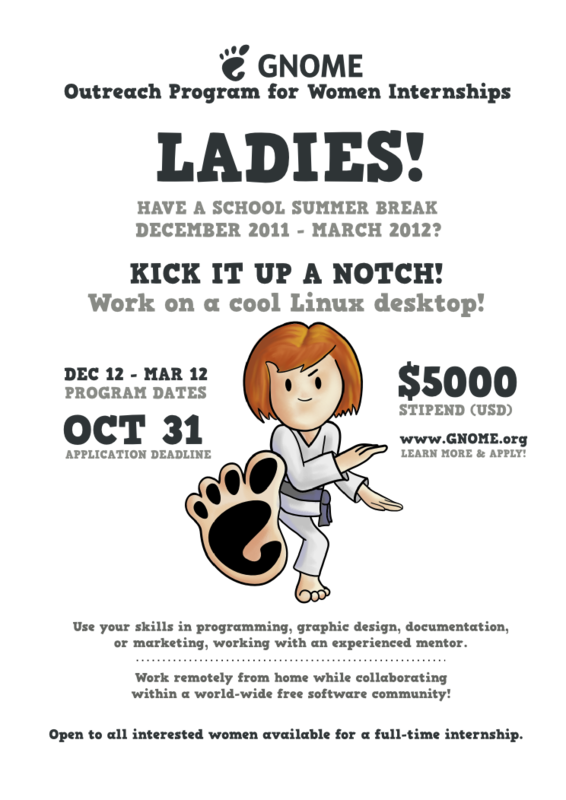 This will be the Outreach Program for Girls. There are many other groups of people underrepresented in free software – people from the Middle East, Africa, and East Asia; people of color in North America and Europe; people from disadvantaged social-economic backgrounds, people with disabilities. Empowerment and access are the main tenets of free software, and we need to do so much more to involve all these people. As Karen Sandler recently said to me, the current program is incomplete. Once we have a solid financial situation for OPW, we’d like to evolve it into OP-UP – the Outreach Program for Underrepresented People. Lukas Blakk is starting the Ascend Project for Mozilla, which will offer a 6 week course in contributing to free software, complete with financial support, to people from disadvantaged backgrounds. The first course will end in October, and I hope we can open the next round of OPW to graduates of this course as a pilot for OP-UP. Being the community which fostered OPW and brought many free software organizations together to involve more of humanity in developing free software is earning the GNOME Foundation a lot of credit. It helps more people find out about GNOME and learn about the amazing product and community we have to offer. People notice how polished GNOME is. We went from 985 people contributing for the 3.10 release to 1,140 people contributing for 3.12! We shouldn’t forget how much we have achieved, when we consider what our software is missing or who our community is missing, and continue on to make things better. I recently became an advisor for the Ada Initiative and I have been a proud donor since it was founded by Valerie Aurora and Mary Gardiner two and a half years ago to enable full-time work to promote participation of women in open technology and culture. As someone who is also working on increasing participation of women in Free Software, I know it’s an area we can make dramatic progress in in a few years, but it takes a focused and full-time effort to make this change. Supporting and reaching out to women and other underrepresented groups is essential for extending the opportunities Free Software provides to more people and making our software better. This year, there were 41 women among 230 GUADEC attendees, which is 18% women attendees. Four years ago, there were 8 women among 160 attendees, or 5%. People often comment that it feels more natural that there are more women participating in the conference. I think it feels that way not only because the tone of the conference changes when more women are present, but also because it feels good to know that a whole segment of population is no longer staying out. This pent up demand is being echoed in other communities participating in the Outreach Program for Women. The Wikimedia Foundation has 7 women participating in its Google Summer of Code, while they have only ever had one woman participate before. The Linux Kernel had 39 Outreach Program for Women applicants, 11 of whom landed 148 patches during the application process, and 7 of whom were accepted for the program. The Ada Initiative helps make conferences a friendlier environment for everyone, connects women and allies with its blog and AdaCamps, and helps fight the impostor syndrome which affects many women in technology. I have learned a lot from the Ada Initiative blog, used it as a platform to reach Outreach Program for Women applicants, and met new Outreach Program for Women mentors and coordinators at AdaCamps. 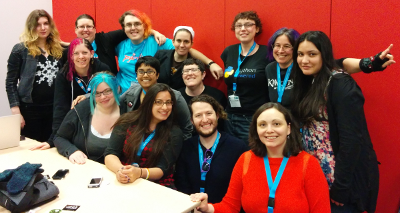 A post on the Ada Initiative blog about Courtney Stanton’s effort to attract women speakers to a game conference she organized taught me that even once women are participating in the community, they are hesitant to present at conferences and some encouragement can go a long way. With a supportive e-mail and some brainstorming, we brought the number of women who presented at GUADEC this year to 10, or 21% of speakers, compared to only 4, or 7%, last year. The size of the strides we can make in increasing the inclusiveness of Free Software depends directly on the financial support the Ada Initiative receives during its current fundraising campaign, which will enable it to plan the breadth of its activities for the next year. Please join me in ensuring we keep making big strides. Applications for the new round of the Outreach Program for Women internships are open, and now the program includes not one, not two, but ten participating organizations! The participating organizations are: Deltacloud, Fedora, GNOME, JBoss, Mozilla, Open Technology Institute, OpenITP, OpenStack, Tor, and Wikimedia. The application deadline is December 3, and the internships will take place from January 2 to April 2. Needless to say I’m very excited about this expanded effort and keen to see how it works out. Big thank you to Karen Sandler for the original idea to include multiple organizations in this effort, which she shared with me first time we ever talked on the phone, and for all the work she has done to make it possible! Thank you to Bradley Kuhn from the Software Freedom Conservancy (SFC) and to Jessica McKellar from the SFC’s Twisted project for being our first partnering organization last round and helping us figure out how to scale up from one to two. Thank you to Sumana Harihareswara for committing to have Wikimedia participate in the internships and with that putting the wheels in motion for planning this round. She inexplicably thinks it was she who buttonholed me about this at the Google Summer of Code mentors summit, but I came looking to talk to her. Thank you to coordinators and mentors from all the other organizations who joined and are making this happen! Thank you to Máirín Duffy and Barbara Muraus, who updated our program flyer and cartoon, respectively! Thank you to Red Hat for supporting my work on this and committing to sponsor seven internships for the program! Finally, the biggest thank you to the GNOME community – to all the mentors and past interns and everyone who helped – for being the first adopter of this program and showing it can run successfully! We still need your help! Although now we have a mentors list with 44 awesome GNOME mentors whom interns can turn to for project ideas, it would be helpful if you added the ideas you have and are willing to mentor to the ideas list for this round. You can also help spread the word about this round by using the prepared e-mail, flyer, or social network updates from our spread the word page or personally encouraging someone to apply. If your company is able to sponsor one or more internships, either for GNOME or other organizations, it would be really helpful. Each organization only has 1-3 internship spots funded at the moment. Please let Karen and me know if you can help. We are planning to have another round in the summer, so if your organization would like to join the program then, please come talk to us too. 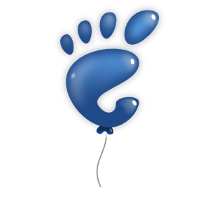 Did you first start contributing to GNOME after January 2010? Then you must still remember the confusion and the clarity, the friendly people and the trolls you encountered on your path. Please take Kevin Carillo‘s well-researched survey about your experience as a newcomer and how it shaped you as a contributor. The collected data will be released under a ‘share-alike’ Open Data Commons Open Database License (ODbL) and the published materials about the research will be publicly available. The results of this research will be of great interest to everyone in Free and Open Source Software and your response would help ensure that we have a comprehensive set of data about newcomer experiences in GNOME. Thank you! The application deadline for Google Summer of Code and GNOME Outreach Program for Women this year will be April 6, and the internship dates will be from May 21 to August 20. Organizations accepted for GSoC will be announced March 16, but we need to start encouraging the potential applicants to prepare to apply for both programs as early as possible. In OPW, connecting applicants who are new to the project with mentors who can help them with their first contribution is an important part of the process. For a student, connecting with a mentor and starting to contribute to a project is the best way to prepare to apply for GSoC as well. The big change for this round of OPW is that, instead of the dedicated list of mentors, we now point the applicants to the GNOME-wide list of mentors. I moved the OPW list of mentors there a few months ago, and people have been adding themselves to it. With this list, we now provide all newcomers with a way to find a mentor in GNOME who can help them with the first contribution! Please add yourself and your project to it. I created an information page for mentors in GNOME with ideas that have proved to be important for OPW, such as requiring the applicant to contribute to the module they are applying to work on and encouraging manageable projects with commits throughout the internship period. Please help students interested in working on your module, make sure they have the necessary skills by having them fix a small bug, and guide them in proposing a viable and manageable project. I have also encouraged other organizations to create lists of mentors or provide links to other ways newcomers can connect with mentors in their organization. These are compiled on a GSoC wiki page and will provide a way for more students to gain the necessary experience to successfully apply for GSoC. 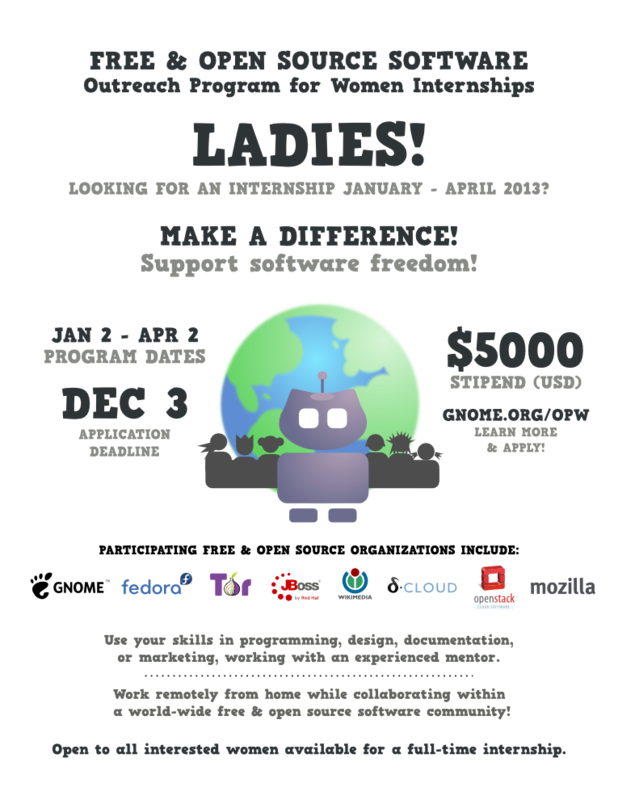 In particular, we will spread the word about this resource among various technical women groups, which will help encourage more women to participate in GSoC. 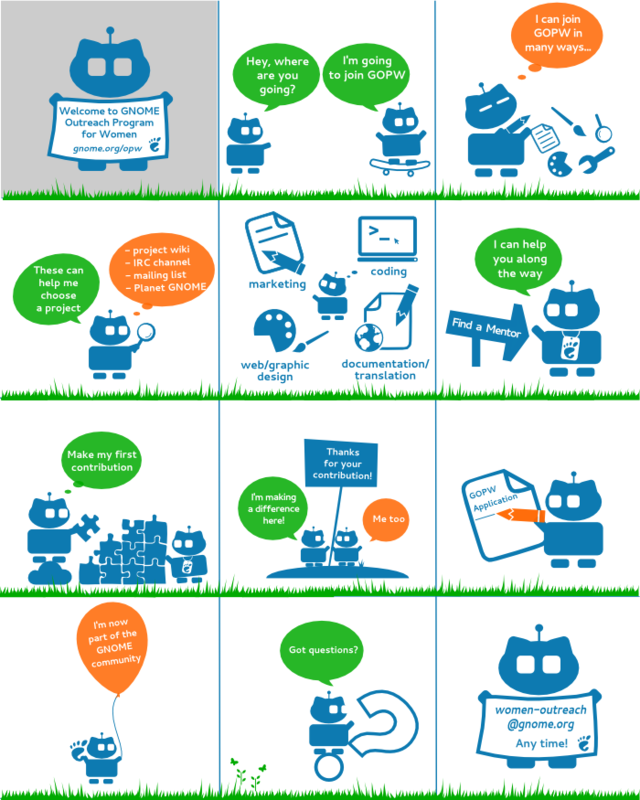 Four creative OPW interns – Liansu, Christy, Meg, and Tamara – made an awesome cartoon to better explain the OPW application process. Their collaborative work spanned 90 e-mails over a course of a month. GNOME mentors, can you spot yourself in the cartoon? In addition to mentoring, please help spread the word about GSoC and OPW by sending a prepared e-mail to your university’s Computer Science department or to a local FOSS group, distributing flyers on campuses and at events, and posting updates on social networks. I’d like to tell you about four women who have inspired me to no end with their work, insight, and community outreach. Every interaction with them has motivated me in my work. Essentially, by being as dedicated as they are, they bring out the best in other people. I’m lucky to have met all of them and to have worked with them on community outreach efforts. Joanmarie Diggs has worked for the Carroll Center for the Blind for the last 14 years, helping visually impaired people learn to use assistive technology. She decided to teach herself programming in order to contribute to Orca, GNOME’s screen reader. She eventually became the maintainer of Orca. Exactly a month ago, she was hired to work on GNOME accessibility at Igalia within 4 hours of posting on Twitter that her grant-funded position at the Carroll Center had been cut. Joanie’s tweets are always infused with a great deal of humor. She says “Random thought: I wonder if I’ll ever shovel snow again….” in the wake of her move from New Hemisphere to Spain. Joanie has been a very caring mentor for one of the participants in the recent round of the GNOME Outreach Program for Women. She is the best role model I know for any woman getting involved in GNOME development. Máirín Duffy is an interaction designer at Red Hat. She has a strong commitment to graphic design with free software. She has been using 100% free software to create her designs for many years now and has created many resources and opportunities for others to learn free software graphic design tools. Máirín created the Fedora Design Bounty project to provide people interested in contributing to Fedora design with well-defined tasks suitable for beginners. She created some great flyers and art work to promote the Fedora Design Suite spin at SXSW. She ran Gimp and Inkscape classes for local middle school students and for Girl Scouts, creating great resources for both. Helping Máirín with the Girl Scout classes and going over these resources was actually how I learned do useful things in Gimp and Inkscape. Máirín has showcased 17 open fonts in an “Unpackaged Font of the Week” series in her blog. There is always some fun and inviting project she talks about in her blog, accompanied by great pictures, designs, and educational resources. Jessica McKellar is a recent MIT graduate who works at Ksplice. 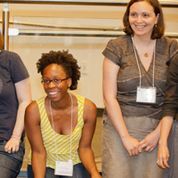 She organizes Boston Python Workshops for women and their friends. These workshops assume no prior knowledge of programming and walk the attendees through the installation steps, basic Python constructs, interactive programming exercises, and small projects during a 1.5 day event. Jessica explains programming in an engaging way and she and other volunteers help the attendees with any stumbling blocks throughout the event. These workshops get filled up within days of being announced and, in response, have grown in the number of attendees they accommodate. Being able to learn how to program in a supportive environment where any setback is resolved within minutes is tremendously empowering to the attendees. Jessica has found a great approach for helping more women feel confident about learning to program and the detailed materials she has created are now used for similar workshops in other cities. Jessica is one of the maintainers of OpenHatch, a community website that provides the information and teaches the necessary skills for getting involved in free software. Open Source Workshop is another event Jessica recently organized together with Asheesh Laroia, who is the creator of OpenHatch. This workshop walked the attendees through the basics of free software contributing and gave them hands-on experience with using IRC, working with patches, and triaging bugs. Participating in such events gives the attendees the necessary confidence to make their next steps in the free software world. The first step is often the hardest and the community events Jessica puts together help many people make it. Stormy Peters is the Head of Developer Engagement at Mozilla. Before that she was the Executive Director of the GNOME Foundation. After leaving that position, she ran for the 7 person GNOME board as soon as she had a chance, coming in first with the largest number of top votes. Stormy is also the founder and president of Kids on Computers, a nonprofit organization setting up computer labs in schools where kids have no other access to technology. Her leadership and ability to connect people is a great gift for all the organizations she is involved with. Stormy has been my go-to person for the last two years in which we have been working on the GNOME Outreach Program for Women. She championed the need to revive the women outreach initiative in GNOME and has helped with everything from getting sponsorship to answering applicant inquiries. It’s a great luxury to know that I can get sound and helpful advice from her about anything related to the program. When not bouncing ideas off of Stormy, I like reading her blog posts. They are just as insightful, both on matters related to free software and on other things in life. Would You Like an Awesome New Contributor for Your Project? We recently opened the application process for the new round of GNOME Outreach Program for Women internships. We already have 15 projects participating in the outreach effort, but it would be great to have more projects on board. As a mentor, you would help the applicants who select your project make a first contribution by October 31. An initial contribution is a required part of the application process. Then, if you get a strong applicant for your project who is accepted, you would guide her in her contributions to your project from December 12 to March 12. Unlike what is considered typical for Google Summer of Code projects, you don’t need to come up with an idea for a stand-alone project for your intern. Instead, we’d like the interns to start with smaller tasks (i.e. bugs) and progress over time to more complex tasks (i.e. features), with each task being suggested by you based on the current priorities of your team. Ensuring that the interns work on manageable and relevant tasks helps with the important goal of getting their work incorporated into the projects during the internship period. Having your project listed among the participating projects might help bring in a new contributor this round or at some later point. We encourage women interested in contributing to contact mentors for the participating projects at any time during the year. So please add your project now! Just how awesome were the interns in our last round? Here is a summary of their impressive accomplishments. Thanks to them and to their mentors for making it such a successful round! We had 8 Outreach Program for Women interns. We also had 7 Google Summer of Code interns, who were encouraged and supported by the Outreach Program for Women. In addition to their contributions, many of the interns participated in GNOME events. Julita, Kelly, and Tiffany attended the Open Help conference and GNOME Documentation hackfest in Cincinnati. Ekaterina, Julita, Anita, Tiffany, Tamara, Raluca, Srishti, and Madhumitha attended the Desktop Summit in Berlin. Meg, Tiffany, and Nohemi are coming to the Montreal Summit. The new participants and their contributions are definitely energizing the GNOME project! We are starting an application process for the third round of GNOME Outreach Program for Women internships just in time for the Software Freedom Day! Please help us spread the word about the program by bringing a few flyers to the event in your city or making an announcement about the internship opportunities at the event. You can just tell people to check out the main GNOME website for more information. It is particularly important that people heading to the Software Freedom Day in places in the Southern Hemisphere help us spread the word. The December to March internship dates are aimed at the college women there who will have a school summer break during this time. However, because any woman who is available for a full-time internship is welcome to apply, you might reach just the right candidate by letting people know about the program in Kokkola, Finland (the northernmost place on the SFD events map). For a similar round last year, we had two participants from Brazil and a participant each from Argentina, Canada, Chile, India, Malaysia, and USA. The application deadline is October 31. During the program, the interns work remotely, while being guided by a mentor. The participating projects include ones in programming, graphic design, documentation, and marketing. With the great work done by eight Outreach Program for Women interns last round, the GNOME 3.0 release has far more contributions by women than any previous release in GNOME history. With 15 female interns accepted for the Outreach Program for Women and Google Summer of Code, GNOME 3.2 will be in a good position to beat this record. Read more about this in today’s press release! I would like to personally thank all program sponsors, Collabora, Google, Mozilla and the GNOME Foundation! Thank you to Red Hat for supporting my work on this program! Thank you to Máirín Duffy, Stormy Peters, Rosanna Yuen and the GNOME Board of Directors for the help and support in organizing this program. Thank you to Sumana Harihareswara, Dave Neary and Owen Taylor for helping me prepare the press release. Most importantly, thank you to all the program’s mentors for doing the essential work of helping the applicants and eventual participants contribute to their projects! What struck me while reviewing the applications was how this program presented a special opportunity for each participant. They all had previous experience with GNOME and Free Software, worked hard to prepare their applications, and saw the program as a great fit that will allow them to take their involvement in Free Software and their professional accomplishments to the next level. So far I shared two tips with them. Being told to read the code is normal. As are multiple passes in a patch review. Please welcome them when you see them on Planet GNOME and point them to the right line of code when they have a question on IRC :).